Laser power meters usually stay in calibration for an extended period of time when properly maintained. Not every laser user has a high quality laser power meter available as reference for uncalibrated, damaged, second hand or DIY laser power meters. 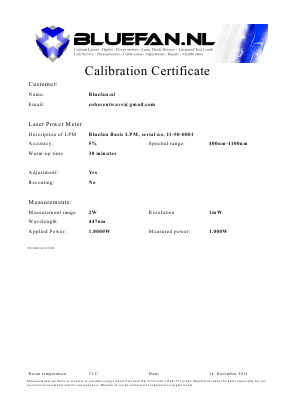 Bluefan.nl offer a calibration and adjustment service for those lasers users. Bluefan.nl does not offer a NIST traceable calibration but this also makes the calibration affordable for laser users on a smaller budget. A basic single point single wavelength calibration is only 15 euro. Calibrations at multiple wavelengths, linearity and stability tests can be requested in addition. The optional adjustment requires an easy accesible calibration adjustment. The power meter is then adjusted to read as accurately the power applied. After the adjustment the calibration is done. The optional recoating is useful for damaged or discolored coatings of the sensor's surface. Any adjustment or calibration is done after the recoating. Calibrations are done with a Laser Precision Rk-5710 with RkP-575 probe as reference. The spectral flatness of this power radiometer is +/- 0.5% and the calibration accuracy is 1.5%. Photodiode based laser power meters are available for specialized cases, for example a HP 8152A with 2 HP 81521B heads for NIR and telecom lasers is available. The specified warmup time of the equipment is taken into account. The customer can choose the warmup time of his power meter.